The bus was transporting members of the Humboldt Broncos Junior Hockey team to a match when it collided with a truck in Saskatchewan. 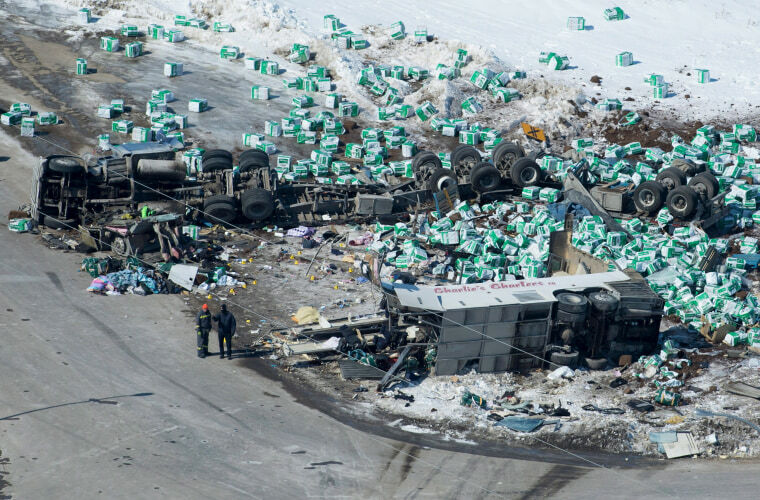 Fifteen people were killed when a bus carrying a junior hockey team collided with a transport truck in Western Canada Friday, Canadian police said. Fourteen other people were rushed to hospitals. Police initially said that 14 people were dead, but Royal Canadian Mounted Police said Saturday afternoon that an additional person died as a result of the crash. Police had said earlier that three of the injured were in critical condition. Police said 29 people were on board at the time of the crash. The team was some 18 miles north of the town of Tisdale when the collision happened at around 5 p.m. local time (7 p.m. EST) Friday. Royal Canadian Mounted Police assistant commissioner Curtis Zablocki said a tractor trailer traveling west collided with the bus. It's "too early to comment on the cause of the collision," he said at a news conference. The truck driver was not injured but briefly detained, he said. Canadian police said they could not yet confirm the identity of the victims or whether they were players or coaches. But some family members have stepped forward with information. Darcy Haugan, the Broncos' head coach and general manager, is among the deceased, his sister, Deborah Carpenter, told NBC News. "His death has left a gaping hole in our hearts," she said. Bill Chow, president of the Saskatchewan Junior Hockey League, told reporters, "I don't have a lot to say other than the worst nightmare has happened." "Our Broncos family is in shock as we try to come to grips with our incredible loss," team president Kevin Garinger said in a statement. "The Humboldt Broncos organization has experienced incredible tragedy," he said. Canadian Prime Minister Justin Trudeau tweeted his condolences to the families of the victims. U.S. President Donald Trump said on Twitter Saturday that he spoke with Trudeau "to pay my highest respect and condolences to the families of the terrible Humboldt Team tragedy," and " May God be with them all!" Vice President Mike Pence said on Twitter, "Our hearts go out to our Canadian neighbors." The NHL's Chicago Blackhawks and Winnipeg Jets planned a moment of silence before they faced off in Winnipeg Saturday. The teams said players would wear the word "Broncos" on the back of their jerseys in solidarity with the junior hockey team, that half of a raffle would be donated to the Humbolt Broncos, and that each team and the NHL would also contribute $25,000. "Words cannot describe the sadness in our community tonight," Humboldt Mayor Rob Muench said in a tweet. Meanwhile Darren Opp, President of the Nipawin Hawks hockey team, said players and staff from the Hawks were waiting to help. "They are sitting in the church just waiting to hear any good news," he said Friday.